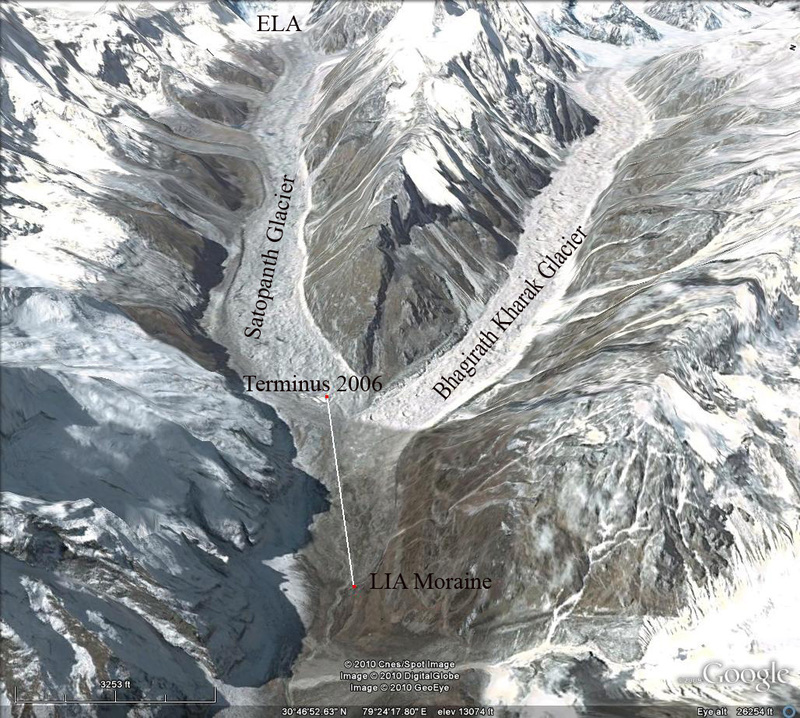 Satopanth and Bhagirath Kharak glaciers are located at the headwaters of the Alaknanda River, Uttarakhand, India. 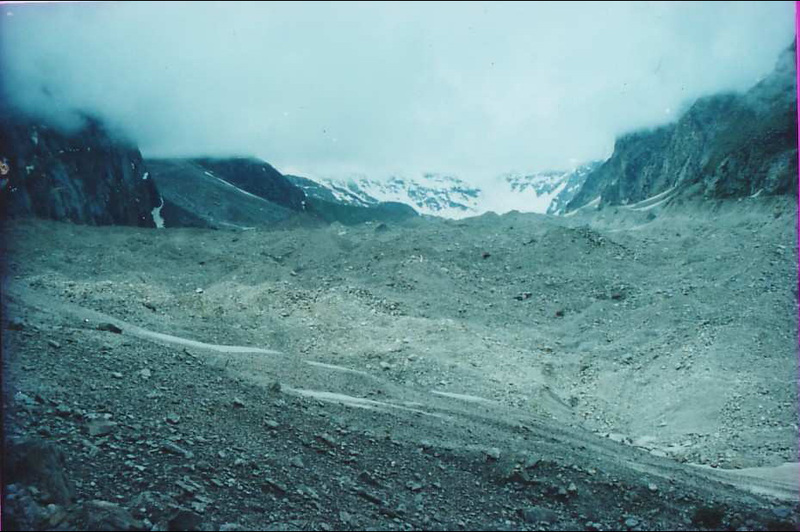 Satopanth glaciers has been assessed for the 1962-2006 period by Nainwal and others 2008 . This is accomplished through a comparsion of the 1962 Survey of India map and a total station survey completed in 2006 since 1962. Examination of satellite imagery indicates a retreat of 1900 meters from the Little Ice Age moraine that is evident. Satopanth Glacier has retreated continuously during this period. The total recession of the terminus which is at 3870 meters ranges from 1160 meters to 880 meters depending where on the glacier front retreat is measured, the average rate is reported as 22 meters per year (Nainwal and others, 2008), , for a total average retreat of 970 meters. The image of the terminus below is from the work of Nainwal and colleagues at Garhwal University. (Nainwal and others, 2008) . 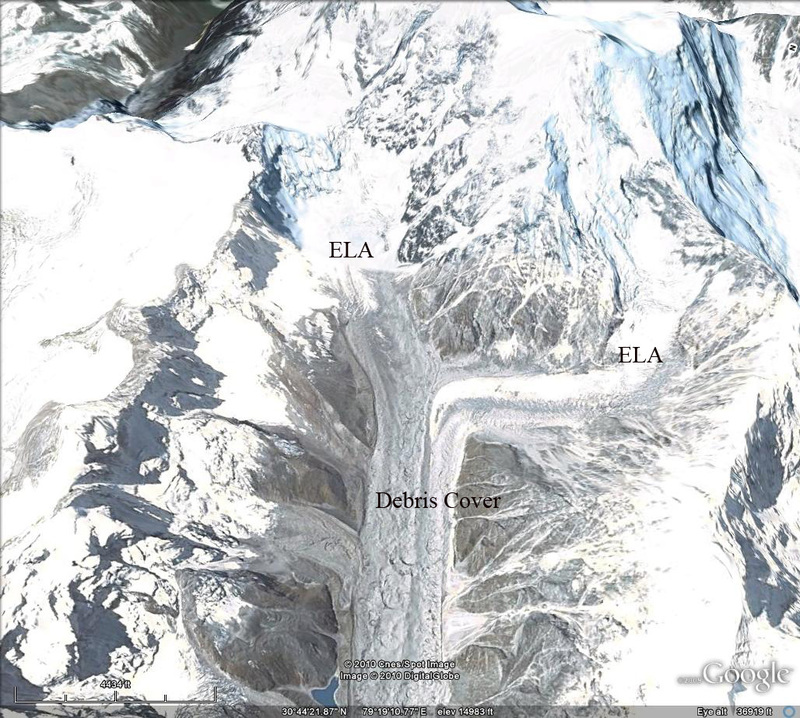 The glacier has an equilibrium line altitude of 4800 meters, below 4700 meters the glacier is dominantly debris covered, the mean elevation of the glacier is, above the ELA, at 4900 meters. This debris cover is thick enough to retard ablation and also prevent black carbon from enhancing ablation on this section of the glacier. 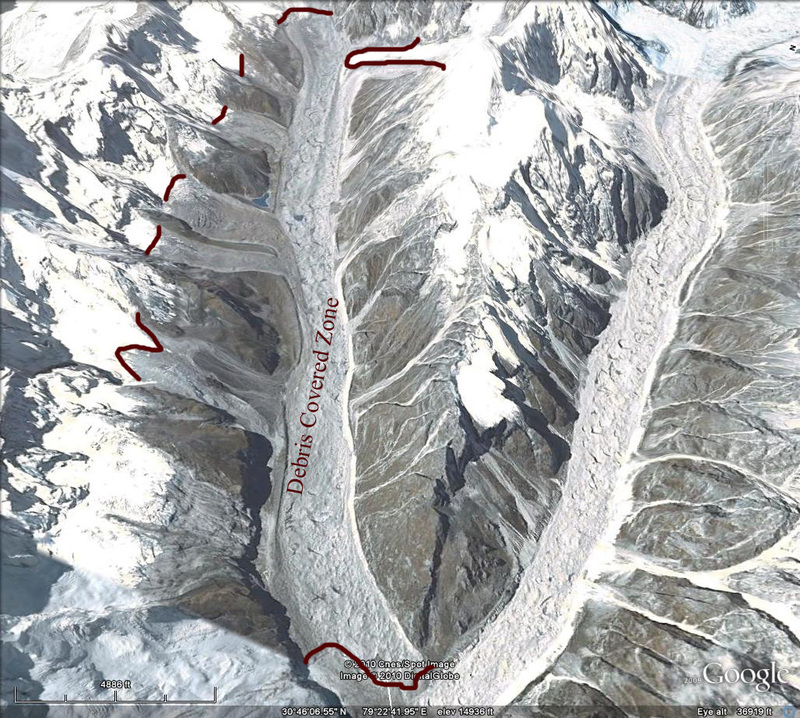 This glacier has a similar behavior, but a more limited accumulation zone than Gangotri Glacier or Khumbu Glacier. The transition zone where the glacier is not debris covered and there is significant melting comprises 20% of the glacier. The remaining 30% of the glacier is in the dry snow zone, where melting is limited and hence black carbon again has a limited role. The recession of this glacier is slowed by the debris cover. An alpine glacier needs a minimum of 50% of its area to be in the accumulation zone to be in equilibrium, this glacier has 40% of its area in the accumulation zone, hence retreat will continue. The debris covered area is illustrated in the first image below, the ELA in the second image and the accumulation zone in the third image. It is apparent that the zone of melting (ablation) is significantly larger than the accumulation zone. Run of river hydropower projects to yield 140 MW have been proposed for the upper Alaknanda River basin. Satopanth Glacier will be a key contributor to this project.